Is Sonoma ready for visitors? In October of 2018 we drove up to Sonoma to visit businesses that were severely impacted by the 2017 Wildfires. It was almost a year since the tragic wildfires and we were apprehensive about seeing the lingering devastation. We were also curious to see if there had been visible progress toward the recovery. Our first stop was Coffey Park, a high-density residential area in the heart of Santa Rosa. Local businesses are the bread and butter of our economy. For every $100 you spend at local businesses, $68 remains in the community. Independent retailers return more than three times as much money per dollar of sales to the community in which they operate, and they are more likely to hire locals, who in turn, reinvest in the community where they live. In our Sonoma County Giving Back mission we wanted to let the local businesses know that we specifically came to see them, see how they are doing and wanted them to recover faster, stronger and better. We saw a strong Sonoma, but in order for them to fully recover from the devastating fires, the region will need the support of locals and visitors alike. Backyard is a hyper-local restaurant in Forestville with menus that can change daily. Food ingredients are grown, raised or line caught locally. They use the season’s harvest from their local farm, Bee Run Hollow, to create a style of rustic, California cuisine, in a West Sonoma County fashion. Backyard's mission is to bring the experience of Sonoma County's backyard to your table. They also have a wonderful dining on the patio.During the 2017 wildfires, Backyard closed down the restaurant for weeks and turned their kitchen into a much-needed community cooking center. They offered their supply of farm fresh food by the truck load. Backyard chefs and cooks made meals around the clock for food deliveries to wildfire victims. Austin and Melissa Lely started Bee-Well Farms in 2015. They were growing an acre and a half of produce for local farmers’ markets, and raising more than 400 chickens for egg production. Hector is a lovely small local honey bee farmer that sells his products primarily at the Farmers Market or a local Farmstand. He lost 52 beehives in the 2017 Wildfires and the recovery process has been quite difficult. He needs to buy equipment, build new boxes, re-establish more colonies, and find locations with enough forage for his hives. Ways to help:Purchase his products at the local farmers Markets or contact him directly for larger quantity orders. Open year-round, very popular with locals popular with locals, and it’s a great place for visitors to put together a picnic for a day’s outing. It offers wonderful fruits and veggies, locally-produced foods baked goods, flowers and plants, and numerous hand-made craft items. Open Fridays: 9 a.m.-12:30 p.m.
Old World Winery is a small, family owned winery and farm. Fourth generation winemaker. Darek Trowbridge is the Winemaker and his Great-Great-Grandfather started the farm in 1890. Darek uses the traditional practices to produce all-natural wines and cider; no yeast or chemicals are added to the fermentation process. Chickens and pigs are also raised on the farm. Grapes are harvested annually through involving community members only. Everyone can participate usually in the month of September. Darek and his family lost their home to an accidental fire the previous year and lost a Syrah vineyard that Darek had spent 5 years working on to bring it to health and was hoping to see the fruits of that labor in 2018. The fire took a toll on all their health. The air was toxic for quite a long time. They lost friends, and everyone new someone that lost their home. Since October they have lost 50-60% of local visitors to their tasting room that had been established a decade ago. They state they have gained a deep appreciation for what they have and for their amazing community. Ways to help: Visit them in their Tasting room. Purchase their fabulous natural wines, and sometimes you might even get to know their fun farm animals and pick up some eggs along the way. Tierra Vegetables produces high quality food and fiber products through sustainable farming. They sell locally grown and produced fruits and vegetables on their farm, including many varieties of chilies and beans. They also offer a great CSA box program which contains seasonal produce weekly. Tierra Vegetables lost a majority of their customer base from the loss of nearby neighborhoods/homes. Beltane Ranch is a sixth-generation family-owned operated working ranch, a vineyard, a winery, a registered landmark and a Bed & Breakfast Inn with roots way back to 1892. They also rent their ranch out for weddings which usually occur during the weekends. Large areas of the ranch were damaged in the 2017 wildfire. The fire even burned through the water pipes feeding the Beltane hoses, forcing the family to manually use shovels and rakes to keep the fire away from valuable structures. Many structures were saved, but some of their valuable wine and other property was not. Paradise Ridge is a winery in the Russian River Valley established in 1994 by owners Walter Byck and Marijke Hoenselaars. The winery is a place where guests can savor vineyard-designated wines and take in sweeping wine country views. The two-story tall, metal Love sculpture still stands at Paradise Ridge Winery, in Santa Rosa. The winery’s estate tasting room, wine production facility and some of the surrounding vineyards and gardens were destroyed by the Tubbs. Luckily their vineyards and art survived and became a source of comfort to the community. They are planning to rebuild. Their sixth restaurant, named the Willi’s Wine Bar, was completely destroyed in the 2017 wildfire. However, the current plan is for the award winning restaurant to reopen exactly one year later. The location is still undecided, however the owners promise it will carry on Willi’s signature comfy, laid-back style, including a patio for al-fresco drinking and dining. Dustin Valette established Valette restaurant in Healdsburg in 2015. Valette was born from two brothers’ lifelong dream of creating a unique dining experience in their hometown of Healdsburg. Their goal is to provide a canvas for local farmers, winemakers and artisans to showcase their crafts. During the 2017 wildfire crisis, at high financial cost to himself, his business made 150 meals that first day, and about 400 dinners a night for the first responders, a pattern they continued for about a week and a half. The meals didn't just provide sustenance but an injection of morale. He and the rest of the community is recovering from the long lasting effects of the fires. Is an alternative healing clinic in Santa Rosa created by Lily Mazarella. Once the fires started, many Practitioners, bodyworkers, and herbalists mobilized immediately to create dozens of pop-up Integrative Healing Clinics at base camps and shelters. One of them being Farmacopia. Together they changed the model of what emergency response looks like by providing natural remedies to help people with compromised health. They offered healing treatments to firefighters at the base camp including acupuncture and massages. A local vendor has put together a pre-made gift basket that has a collection of Farm Trails member products. The Farm Trails Edition Sonoma Love Gift Box contains products from those that have been affected by the 2017 wildfires, and is a way to support them. This specialty box is $84.95. Sonoma County Farm Trails is a wonderful organization that has worked for decades to promote local agriculture, family farms and educating the public about the importance of supporting local agriculture. In their member directory you will find local produce and family farms, vintners, local restaurants, B&Bs, Nurseries, tours and events and much more. Many of our company giveaways were purchased from some of these businesses. When visiting them, you can indulge in the many produce and culinary options they offer, experience the passion and dedication their members have for their craft and make wonderful memories with your family and friends. This is a fabulous way to meet and explore Sonoma County farms with friends and family. History of the Segassia Vineyard is spectacular. Mt. Vedeer of the Segassia Vineyard has an amazing fruit source, most spectacular grapes, cultivating extraordinary Cabernet Sauvignon. This hillside was first planted to vineyard in 1886, and the original hearth is still there, steps from a mountain spring that sustained the vineyard. Mt. Vedeer is an amazing Vineyard with spectacular grapes. Chris Cates, a retired Cardiologist, purchased the vineyard in 2012 to funnel it into some great projects and bring it back to the roots of the properties working only with small producers and winemakers. The Nuns fire burned parts of Glen Ellen and Kenwood in Sonoma and spread over Mount Veeder—which has many vintners, like the Cates—into Napa Valley's west side. The fire tore through Segassia Vineyard’s 15-acre vineyard and cellar on the top of the mountain. The Cates had just replanted two blocks of vines six weeks before the fires struck. They also lost verticals of Segassia wines dating back to 2006. His son, Andrew Cates, who operates Segassia Vineyard, also lost his home in the fire. Forty percent of Segassia Vineyard’s vines were damaged after the wildfires. Multiple structures on their property were burned, and all the irrigation equipment was melted in the fire. While not all the vines were lost, the Crates estimate that it will be 10 to 15 years before the vineyard returns to its former rate of production. It takes 5 years alone to come to full fruition after a vineyard is lost and replanted. While many vineyard owners were in shock over the devastating losses, this father-son team set out to make the best of the tragedy. "We said, 'What can we do in this situation?' … we decided to get active and try to do something good," says Chris Cates. They realized that a lot of grapes became useful for winemaking and were left behind unharvested due to the smoke tent. The importance of reducing food waste is not lost on the Cates family, which is why they developed a patent process for turning wine grapes into raisins several years ago. “If you think about things in the midst of hardship, you can do a lot of good,” says Chris Cates, “but you have to think about them in a different way.” This type of focus led them to test the smoke tainted grapes to discover if they, too, could be converted into raisins. The Cates family enlisted the help of Steve Klein of Buena Tierra Vineyard Management, who mobilized crews, and went from vineyard to vineyard, starting with Segassia and hand-harvested approximately 100 tons of fruit in Napa and surrounding areas. This provided also an additional benefit of a “second harvest” for laborers and vineyards helping them to continue to earn wages. In Nov. 2017, after many vineyards were completely destroyed by the wildfires in Napa and Sonoma County, The Wine RayZyn Company partnered with Food Recovery Network to repurpose unharvested wine grapes from vineyards affected and turn them into Rescue RayZyns™ in support of local wildfire relief. The Rescue RayZyns™ initiative is a way to eliminate food waste and feed victims of natural disaster. The Campaign is in support of local wildfire relief, donating another 50 cents of online sales to Napa Valey Community Disaster Relief Fund. Wine RayZyns are made from hand-harvested wine grapes using a special process that keeps the skin and seeds intact to provide an unprecedented source of fiber, nutrients, and antioxidants. They have more antioxidants then Green tea, Red Wine, and commonly dried raisins. They are Kosher, Non-GMO, Vegan and all Natural. In 2017 our annual event took place in October. This was just a few days after the last of the Sonoma County fires were extinguished. Although we had a wonderful event last year, because of this tragedy, the overall event was bittersweet. Not only were these horrific fires in our own extended community but many of us knew people who were seriously impacted; some who even lost their homes. We vouched then, as a company, to help the people of Sonoma County and the region. The Northern California fires were devastating and the toll they took was massive. The fires began on October 8, 2017 and took three full weeks to be fully contained. More than 200,000 acres burned in Sonoma, Napa and Solano Counties, over 5,000 homes were destroyed, with an additional 4,000 burned. Santa Rosa alone lost over 3,000 homes to the Tubbs fire. At least a dozen wineries have been fully destroyed and at least another dozen partially destroyed. 44 people lost their lives, including 23 in Sonoma County. Even though large areas of the region were left untouched by the fires, the region lost vital business during one of the busiest times of the year as many visitors have canceled after the fires reservations at local hotels, wineries and restaurants. Local farmers lost most of their crops last year because they either burned or rotted while waiting to be harvested. Many businesses extended themselves to help the first responders and others in greater need during the devastating fires, incurring business losses themselves. During and after the fires, electricity was shot off for an extended period creating business losses across the region. Businesses suffered loss of employees due to relocation or not able to come to work or had to lay-off staff due to the loss of income. An event like this is not just a moment in time. The impact to the people and the community is tremendous and the recovery process will take many, many more years. How well they recover will depend on the ongoing support they receive from locals and visitors like us. In October of 2017, which was just days after the last of the Sonoma County fires, Matrix Precise hosted our annual event. The tragedy taking place in the North Bay was on everyone’s mind. We could see the smoke from our venue and many of us had friends and family members seriously impacted by this tragedy. Right then we vowed as a company to find a way to help the region. The Northern California fires were massive, and they took a devastating toll on the locals. The fires began on October 8, 2017 and took three full weeks to be fully contained. More than 200,000 acres burned in Sonoma, Napa and Solano Counties. Over 5,000 homes were destroyed, with an additional 4,000 burned. Santa Rosa alone lost over 3,000 homes to the Tubbs fire. At least a dozen wineries have been fully destroyed and another dozen partially destroyed. 44 people lost their lives, including 24 in Sonoma County. Although large areas of the region were left untouched by the fires, the region lost vital business during one of the busiest times of the year. Many visitors canceled their trips due to the fires, leaving many of the local hotels, wineries and restaurants empty. Last year, local farmers lost most of their crops because they either burned or rotted while waiting to be harvested. Because many local businesses were the first responders to the fire victims, these businesses incurred financial losses themselves. During and after the fires, electricity was shut off for an extended period, creating further business losses across the region. Businesses suffered a loss of employees due to employee relocation, the inability for employees to come to work, as well as staff lay-offs due to business loss of income. Tourism has been down based on the fear that the area has not been stabilized, which slows the local recovery process. With only 10 percent of Sonoma County’s 1 million acres affected overall, much of the terrain has already begun to improve. However, there is still plenty to be done, and how well the area recovers will depend on the ongoing support they receive from residents, governmental agencies and visitors like us. Our first stop was Coffey Park, a high-density residential area in the heart of Santa Rosa. Coffey Park had been ravaged by the Tubbs fire, part of a series of wildfires that claimed 24 lives and destroyed more than 5,100 homes in Sonoma County. More than 200,000 acres were burned in the mountains. In Santa Rosa alone, the flames burned 3,000 homes and damaged or destroyed 29 businesses. We were informed that Coffey Park was an area severely impacted by the Tubbs fire. In fact, many businesses like Applebee’s, Hilton Hotel, McDonalds, and Kmart had completely burned down. Despite our knowledge of the wildfires’ impact, we were shocked to witness that such a large part of the area had been completely destroyed. We learned that many of the locals decided to remain in the area after the fires because of the bond they had formed with their neighbors, which originated from the devastating shared experience of losing their homes. They believed that uniting throughout the rebuilding process would keep them from giving up. Meanwhile, our hearts were crushed at the sight of the homes singed to the ground on every street. Over 1,200 homes were lost in Coffey Park and at least a dozen businesses. These neighborhoods simply aren’t supposed to burn down this way. This area was not known as a high-risk fire zone. Coffey Park was annihilated because the magnitude of the wildfires was so massive that it debilitated firefighters from providing protection to vulnerable homes. As we drove through the valley, we tried to determine how far the fires had reached. We searched the mountain rims for signs of fire damage, although it was difficult to reach a conclusion from afar. Since we were about to visit businesses that had been directly impacted by the fires, we figured we were likely to see some fire damage at these locations. To our amazement, there wasn’t anything near the damage we had observed earlier in the Coffey Park area and most of the businesses were fully engaged in the recovery process. We were in awe of the recovery of the area. Even though, you could see the footprint of the fire, it was quite interesting how well nature has camouflaged the destruction. Burned Oak trees that one could spot looking into the far mountains, blended in with the surrounding beautiful landscape. Parched land was colorfully dotted with green wine stocks peeking out which gave life to the scenery. The rolling hills were once again lined with fully-grown trees, and the landscape was covered in an array of colorfully vibrant orange and dark red earth tones. The picturesque landscape seemed to have diminished the left over traces of a firestorm they once endured. That’s when it hit us. Our perception had been influenced by what we had read, heard, and seen on television. Everyone had been so focused on covering the devastation caused by the Wildfires, along with the human impact. This is most likely the reason why visitors like us tend to be cautious in visiting the area. The reality was that the region was in the midst of recovery needing visitors to spur the momentum and stabilize the economy. Sonoma County was being restored to its rightful, healthy status. In fact, some families were able to move back into their homes just one year after the fires. We could see first hand that the richness of the Valley had returned. A variety of businesses such as growers, farmers, wineries, producers, vineyards, hotels, restaurants, ranches, and pristine parks are what shine through when you visit. Above all, it was the spirit of the people we met in Sonoma, while seeking out struggling businesses to support, that was life changing for us. Their expression of gratitude was humbling, as they told us their story of what they had endured and the difficulties that remain in front of them. Most of the businesses we visited saw a 40-60% decline in business last year due to a drop in tourism. However, through their stories, many times going back multiple generations, we could feel their pride and love for their workmanship. We learned about what made their craft and products so valuable. They showed us how to harvest and use nature to its fullest. We gained an enormous respect for their relentless will to rebuild, continue their craft, and determination to become stronger despite the odds. We were blessed to meet these people on our journey, and it opened our eyes to seeing Sonoma County’s true heart. Witnessing the strength and uniqueness of the people and businesses truly made us look forward to a return visit for a special dose of energy, love and spirit that is seldom seen outside of Sonoma. The recovery of Sonoma County is well on its way, although it will likely take years for businesses and residents to fully recover. Fortunately, the magnitude of the valley’s beauty, the overwhelming strength of the landscape, the diverse specialties of the businesses, endless possibilities of activities and the undying pulse of the people of the North Bay and their relentless spirit is making the 2017 Wildfires merely a footnote to their remarkable history. They are determined to rise up strong – Sonoma Strong. Shelters in these areas are urgently asking for ready-to-eat food. 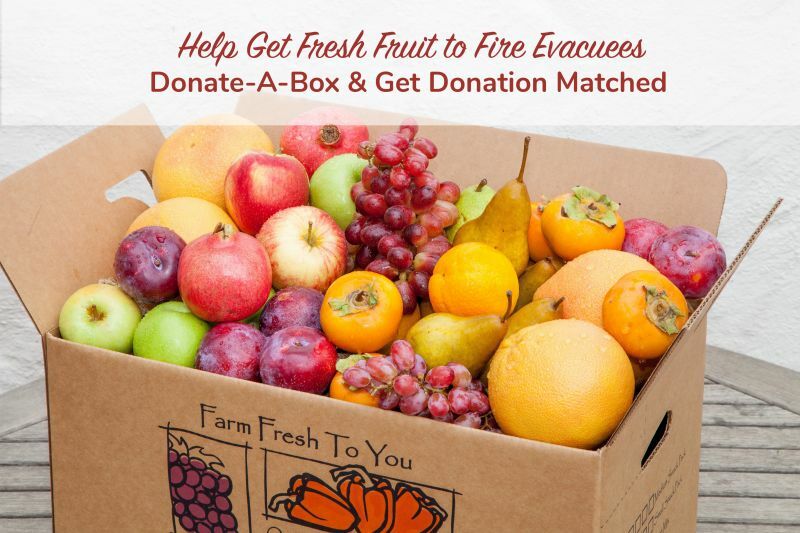 You can help fulfill a specific need for convenient, nutritious food by donating a box of fresh fruit to be distributed to fire evacuation centers through Farm Fresh to you. Farm Fresh To You will match every box donated to the Camp Fire Aid & Woolsey Fire Aid. Through Farm Fresh To You Donate-A-Box Program, you can help get fresh fruit distributed to people at evacuation centers. Farm Fresh to you is currently working with the Food Bank of Contra Costa and Solano to distribute donations to the Camp Fire victims and Westside Food Bank for distribution to the Woolsey Fire victims. You don’t need to be a customer to make a donation. By supporting local businesses such as farms, ranches, restaurants, wineries, and hotels, you help local employees pay their bills, feed their families, and you also boost the local economy. This, in turn, supports those affected by the fires. This is a great way to help the North Bay in its quest to rise, better, faster and stronger. After brainstorming additional ways to support the recovery of Sonoma County’s local economy, we decided to purchase 100% of Matrix Precises’ giveaways exclusively from businesses in all surrounding areas of Sonoma County through the end of 2019. We have specifically sought out businesses that were severely impacted by the wildfires, as well as businesses which have extended themselves to lend a hand to their community. These businesses sacrificed many of their own resources during a time when such resources were essential to their own stability, and somehow they managed to be first to respond to those in need. We have come to appreciate the dedication and passion of these businesses, and in connecting with them, we have even made a few new friends in the process. However, our assistance merely extended to a few of the businesses that were harmed. Because the fires have impacted so many businesses, there is still much more to be done. We hope the information we have researched and provided will help you join our ongoing journey or assist you with the development of your own ways of helping to restabilize the Sonoma County Region. Here we will post ideas for activities that can be done along the trails of our mission to explore and support the North Bay recovery process and items that were recommended to us by locals. Please let us know of the discoveries you have made, and we’ll gladly post them. Westside Road – Starting at the Farmhand Deli in Guernerville, situated along the Russian River on the “Rio Nido Strip” through Healdsburg north. River Road – Starting at Old World Winery in Santa Rosa and driving west to arrive at Café Aquatica, which is at the coast at an Estuary where one can also do kayaking. During our “Sonoma Recovery Mission” we focused on researching businesses which specifically sustained fire damage or were adversely impacted from the fires. The amount of impacted businesses we came across was vast, as one can imagine, and we thought that as inspired we were in wanting to do more when we returned, you might be as inspired, when hearing and reading about our mission, that you want to go on your own exploration to assist Sonoma County businesses in their recovery efforts. Businesses are grateful for supporting their recovery phase. In addition to the businesses we supported on our mission, you can find below a list of other fire-impacted wineries and businesses that certainly are grateful for any support. We selected a few businesses to support. Located their operating hours. – At times we called ahead to find out the type of products they had available especially, for businesses that were listed to have suffered severe fire damages, or total loss. Even severely damaged businesses many times still had product offerings because, they for example stored their inventory at another location and hence it was spared from the fires. We drove there for an in-person visit, to learn about their business, enjoyed their offerings and supported them through purchasing some of their products. You do not need to be familiar with the area, and you do not need to be a wine connoisseur to create your own exploration and with that support the people and businesses in the area. We recognize, unfortunately, that there are certainly many other businesses severely impacted. Willi’s Wine Bar (4404 Old Redwood Highway, Santa Rosa) Burned down. Was one of Top 100 Restaurant for four consecutive years, the wine bar’s ownership group holds five other eateries in Santa Rosa or Healdsburg. More info at our Giving Back page. Ramekins Lost business during their busiest time of the year. Had to lay off staff due to loss of income. Sweet T’s Restaurant & Bar (2097 Stagecoach Road #100, Santa Rosa): Destroyed, per The Press-Democrat. The soul food eatery served barbecue plates and entrees such as shrimp gumbo and fried catfish. Cricklewood Restaurant (4618 Old Redwood Highway, Santa Rosa): Destroyed. The 42-year-old steakhouse’s owners said they were “shell shocked, heartbroken and beyond (s)ad”. Fountaingrove Inn & Round Barn (101 Fountaingrove Parkway., Santa Rosa): “Unable to conduct business in any capacity,” according to general manager Justin Hayman. The boutique hotel’s wood-and-stone exterior was home to 124 rooms and suites. Stornetta Dairy (4310 Fremont Drive, Sonoma): Several buildings burned down. The 101-year-old business changed its named to Clover Sonoma earlier this year. Luther Burbank Center for the Arts (Santa Rosa): Classrooms and east end of the complex are destroyed, but main building has minimal damage. All performances are canceled through Sunday. Paradise Ridge Winery (4545 Thomas Lake Harris Drive, Santa Rosa): Destroyed. They operate a Tasting room. See more info in our mission slides. In A Wednesday morning post, though, it said all employees were safe and vowed to rebuild. Sky Vineyards There’s reportedly some fire damage here, but the facility is still standing. Extent of the damage is unknown. Nicholson Ranch (4200 Napa Road, Sonoma): Some fire damage but all wine remains secure, a post on the winery’s Facebook page said. Nicholson Ranch produces 5,000 to 6,000 cases of pinot noir, chardonnay, syrah and merlot per year. Mayo Family Wineries A house on the property was destroyed by the fire, but the winery itself has so far been spared. Gundlach Bundschu Winery According to reports on Twitter, the property suffered some fire damage, but said its winery and structure were still intact. The family home on the property, however, was lost. The winery was completely destroyed. The winery and its vines, first planted in 1980, produced less than 6,000 cases per year. Winery was a total loss, state of vineyard is undetermined. One of Napa’s oldest wineries. The winery has been owned by the Vandendriessche family since 1870. The Stag’s Leap District winner. Suffered some landscape and vineyard damage, but said the winery structure was sound according to The Mercury News. The Patrick Road fire damaged this Mount Veeder region vineyard to a large extend. A home on the property was lost. See more at our Giving back page. This small-batch family winery, which makes no more than 1,000 cases per year, reportedly suffered a “total loss”. Proprietor and winemaker Michael Parmenter told local media “everything gone except our (wine) cave. Frey Vineyards Winery Alison deGrassi of Visit Mendocino told the Mercury News that the winery, which focuses on organic and biodynamic wines, was destroyed by the fires. Oster Wine Cellars Visit Medocino’s deGrassi also listed Oster, another Redwood Valley staple, as a total loss. Golden Vineyards The vineyards at this Hopland winery are “scorched but they are not ruined,” according to owner Julie Golden (via the Mercury News). The following Sonoma and Napa County events were recommended to us by locals we met during our “Mission Sonoma Recovery” exploration. Further below, you can find General Calendar of Events links to other great event calendars for the North Bay. Sonoma County farmer will open their gates an barn doors to offer a behind-the-scenes peek at life on the farm every October. Meet your farmers & vintners, shop from delicious farmstands, see how cheese is made, pick pumpkins, meet farm animals, learn about beekeeping, sample delicious food & libations and discover some of Sonoma County’s best kept secrets! Chart your course and spend a weekend exploring local farms and ranches, and meeting artisan and vintners as you discover Sonoma County’s agricultural bounty. Fresh Ingredients for your holiday tables, handmade gifts, plus farm tours, workshops and tastings.